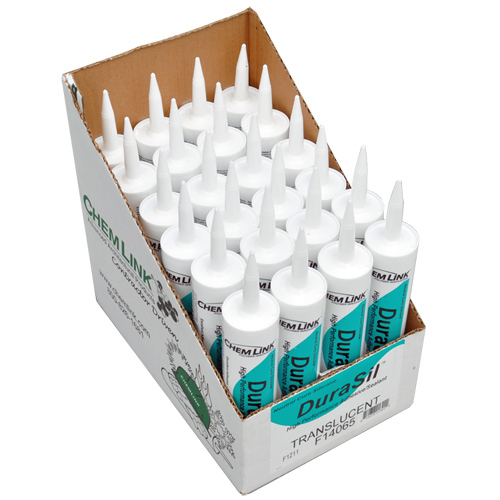 Chemlink DuraSil is a neutral cure (RTV) silicone, adhesive sealant, designed for application on dissimilar materials such as glass, aluminum, steel, copper, masonry and many engineering plastics such as polycarbonate, vinyl (PVC), fiberglass (FRP), and acrylic. DuraSil is also well suited for difficult to bond surfaces such as Kynar 500® PVDF and Tedlar® PVF. 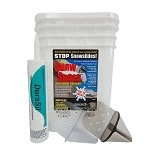 Chemlink Durasil is used as an adhesive for roof snow guards like the Chemlink SnowShoes. Chemlink DuraSil’s low odor, non corrosive, and neutral cure chemistry will not damage unprotected metals. DuraSil is highly elastic and low modulus with mechanical properties capable of low temperature flexibility and 50% joint movement. DuraSil is recommended for metal architecture, windows and doors, curtain wall construction, and glass block. Chemlink DuraSil develops properties rapidly and is effective in many industrial applications where strength, elasticity, adhesion, and speed of set are required. Q: approx how many pieces of snow guards will one tube do?